Japan is a floor-based culture. You sit on the floor, eat on the floor, and sleep on the floor. You argue, drink, make love, watch TV, nurse, and work on the floor. A lot of people see floor cultures like squat toilets: backwards, underdeveloped, impoverished. “That’s where we evolved from,” they’ll say. To be cultured is to move away from the floor, to touch it only with your feet. Sleeping in a bed — hygienic, ergonomic, warm, fluffy — is one of man’s basic triumphs over nature. I used to feel this way. When I first moved to Japan, I slept on a futon because I had no money. I felt like I’d been beaten up every morning and cursed the ridiculously thin blanket that constitutes an authentic futon, quite unlike the doughy, several-inches-thick mats marketed as such in England. But I gradually adjusted to hanging out on the floor. When there is a surface as comfortable as tatami—warm, soft but not too yielding, not itchy, no carpet burn—it makes sense to sit on it. And even when there’s no tatami, well, the floor just makes more sense when the tables are the same height as a sausage dog and the chairs have no legs. I began to type while sitting on the floor. 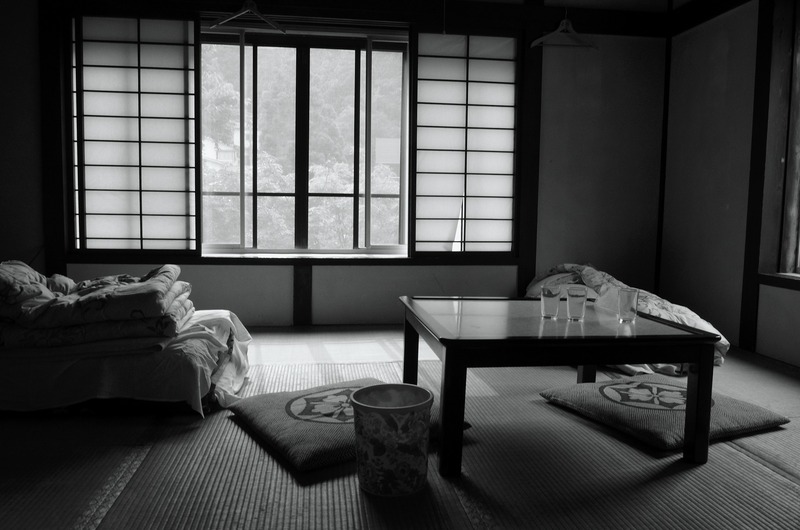 After work, I would sprawl across the tatami to decompress. At restaurants, I’d choose the tables with tatami, remove my shoes and loll around as I liked, drinking sake in my socks. It was glorious. I discovered a comfort and grounding force in the floor. Just like walking barefoot—where a universe of sensation and stimulation erupts as skin meets the ground—being in direct contact with the ground is like earthing an electrical current. This may sound woo-woo, but I think people are already unconsciously aware of this connection. It’s why shivasana, or the “play dead” pose in yoga is so restorative: it’s one of the few times you get to lie on the floor. The rest of the time we’re flopping on chairs or sofas or beds, floating somewhere in the middle of the room, estranged from the ground. Or we’re racing around, unearthed, our feet encased in parcels of air and rubber. In my last few months in Japan, I began sleeping on a futon again because we lost the aircon remote in our bedroom and the summer nights were getting unbearably hot. After a few mornings of the “Did you beat me up in my sleep last night?” variety of back pain, going to sleep on top of the tatami started to feel pleasurable. After a month, lying on a bed felt strange. A few months in and I was sleeping better than I ever had. When the summer ended and we found out we were moving to the Netherlands, I knew the tatami mats were coming with us. Fast forward a couple of months to our rented apartment in Amsterdam. The bed is waist-height and as soft and quivery as a blancmange. It feels like sleeping on a bouncy castle. I toss and turn and wake up every hour. Eventually, insomnia-wrecked, I drag the tatami mats into the narrow strip between my husband’s side of the bed and the radiator, lay a couple of yoga mats and a sleeping-bag on top, and lie down. I am wired and think I have a few more hours of being awake. But as soon as I shut my eyes, I feel this deep, primordial hum. It’s as if I’ve taken a sleeping pill with a meditative side-effect. I feel like I‘m sinking into the floor while receiving a massage from it. Floor! I love floor!